EuroSciCon takes pleasure in inviting the scientific community across the globe to attend the 13th Edition of International Conference on Nanopharmaceutics and Advanced Drug Delivery during August 29-30, 2019 at London, UK with a motto to Explore Innovations in Pharmaceutical Sciences, Pharma Industry, Drug Delivery & Drug Discovery. The gathering will address Pharmaceutical Research in the area of Nanopharmaceutics, while laying emphasis on innovative methodologies in Drug Delivery. 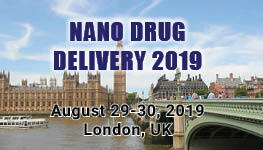 Nano Drug Delivery 2019 will be the best venue for Research Associate, Research Scientist, Directors, CEO’s of Pharmaceutical Organizations, Drug Delivery Technology Manufacturers, Regulatory Affairs Associate, Bio Statistician, Health professionals, Scholars from Pharmaceutical backgrounds, Quality Assurance Specialist, Market research Analyst, Associate Product Manager, Product Manager, Strategy Director, Business Development Manager, Pharmacists, Deans, Students, Professors, Researchers, and Faculty of Pharmaceutical Sciences from Universities and Medical Colleges. This release was submitted by a Newsbox user.Â Any communication related to the content of this release should be sent to the release submitter.